Apart from the main Pisa Tower complex (incl the Leaning Tower, Cathedral, Baptistery and Camposanto), I didn’t have much plans or time, so I was just roaming about on foot. 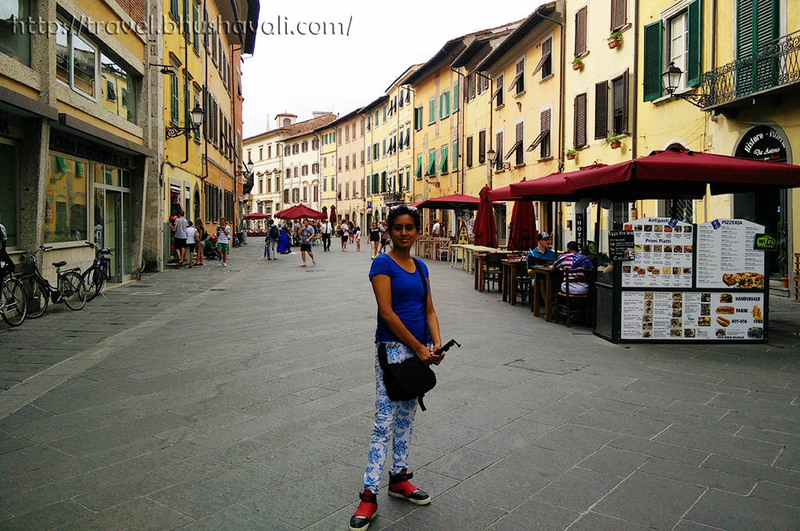 But yeah, Pisa Town is so beautiful that roaming about is necessary to feel the beauty of the Town! After being mesmerized by the awesomeness of Pisa Tower, I chose to walk back to the hostel, just to feel the local impression of Pisa Town. 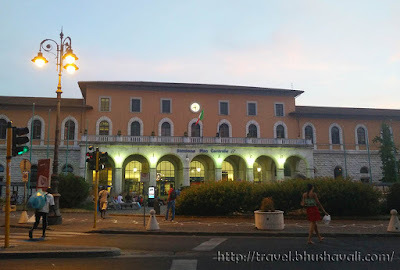 Just before the Pisa Centrale Railway Station is Piazza Vittorio Emanuele II. By evening the entire place was filled with people – youngsters in love, older people chatting, some with a book and/or a dog, office goers relaxing after a tough day…… The setting sun just made the place so beautiful! Most of the streets here were curvy and esp the streets around the Pisa complex were just gorgeously curved, reminding me much of Edinburgh & Bath! Just as I said, then, here too it looks like the place got frozen in time a few centuries ago! Just like how London has Thames, Paris has Sienne, Berlin has Spree, Basel has Rhine, Amsterdam has Amstel and Florence has Amo, here, Pisa has Arno! The river with its colorful buildings on either sides, it was just a visual delight! Just besides Arno, was this tiny little church that I spotted on the way. This tiny little church is called Santa Maria della Spina. Its open from 10 AM to 12 Noon and 5 PM to 8 PM, so unfortunately I couldn’t go inside the church! It’s a cute little Gothic styled church built in 13th C and was rebuilt in 1871. 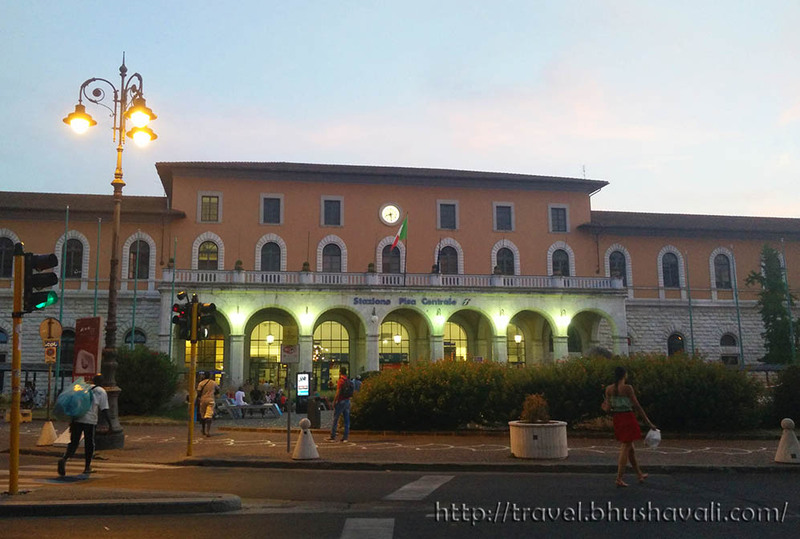 On my way back from Pisa Cathedral, I came across this place called Piazza dei Cavalieri or the Knight Square, which was the 2nd main square since the medieval times. 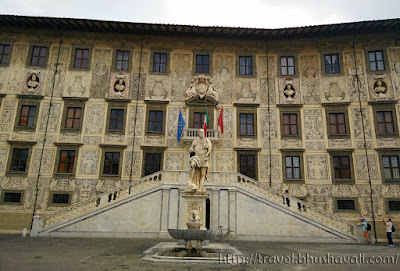 The building that totally caught my attention here was Palazzo della Carovana which houses the Scuola Normale Superiore di Pisa. 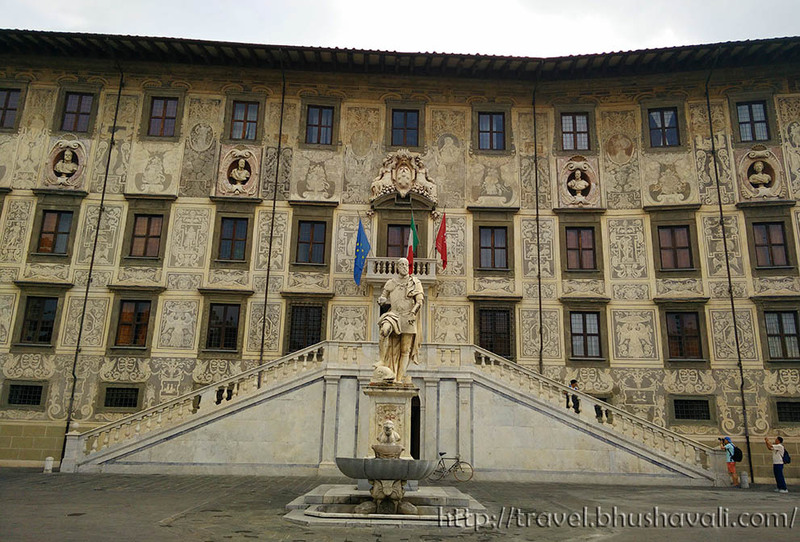 This was built in 1562–1564 by Giorgio Vasari. What caught my attention was the artwork in its exterior by the Sgraffiti technique! The technique is when 2 layers of plaster of different colors, in this case a grey beneath and a white atop. Then the upper layer is scratched off, to reveal the bottom layer forming a gorgeous pattern! The sculpture in the front is of Cosimo I de Medici. 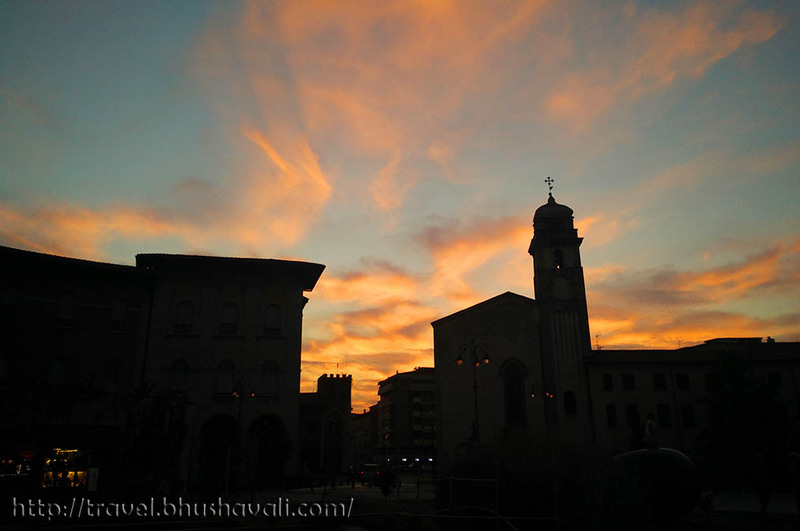 Just beside this building is the Palazzo dell'Orologio also called the Clock Tower. This was originally built in 1288, however got rebuilt several times after that! The present structure is only about a century old! I did spot a couple of installations all over the town. I dunno if they are permanent or keeps changing. Spot the egg shaped installation in front of Santa Maria della Spina. There was a sperm shaped one near the Pisa Tower and this white fluid shape is from Piazza dei Cavalieri! From here I headed over to Milan and that's coming up in the next few posts. Stay tuned. On the other hand, I have 2 good news to share with you guys! 1. Aditi of Lyf&Spice nominated me for 2017 Trip Expert Awards by Tripscam and in turn I nominate Shrinidhi, Indrani and Niranjan. Best wishes! Pisa town looks so pretty! There's nothing like summer in Italy, it's very romantic, especially with sunset views like that over the River Arno. I'll be going back this year, so will need to check it out for myself! Wow, Pisa town looks like the kind of town I want to amble around. The building structure are really beautiful and inviting. You brought me with you once again! The clock tower seemed to be really an interesting this as I have just heard about this. By the way, congratulation on your award, you truly deserved it. Thank you so much for sharing this with us. Congratulations on the awards. They are truly well deserved!! Besides the cathedral and churches, I am mesmerized by the Sgraffiti technique. that is really interesting. When I visited this area it was a quick stop at the leaning tower of Pisa and I have missed all this which is such a shame. It looks a really pretty area so think I will add it to my travel plans next year and explore more than the tower. The only place we visited in Pisa is the Piazza dei Miracoli but the town looks beautiful too which we unfortunately missed. The Santa Maria della Spina church is pretty with those imposing sculptures. And congrats on your achievements. Keep going! Santa Maria della Spina looks so beautiful! Even my first impression was it reminds me of Edinburgh & Bath. Sgraffiti technique is so unusual. As an artist, it really is my dream to visit Italy as much as I can. This is the first blog post I've ever seen where someone somehow managed to enjoy Pisa the town, instead of just commented on the tower. Most other things I read say that Pisa is not worth visiting except for the tower, and the tower isn't really all that, so perhaps skip the whole thing (I did). Perhaps this is the start of Pisa receiving more visitors for the town itself. Congrats on your awards! How exciting and well-deserved! We visited Pisa a couple of years ago but only got to spend time at the tower - which was awesome. 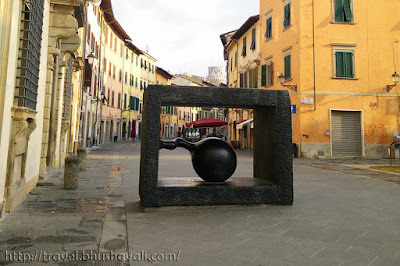 I'm seeing Pisa town now vicariously through your photos! We only spent 1 night in Pisa and regret not exploring more of the town. It was much quieter than Florence and Rome, looks like there's much more to offer than the Piazza dei Miracoli! simply beautiful pics. I love the quaint picture postcard looks of European towns, especially old ones! First of all congratulations for the two good news. I always get fascinated by the curvy streets and colorful houses along. The Pisa town seems worth exploring and Santa Maria church is pretty with that beautiful sculptures. Your pictures are stunning. I would love to go to Pisa Town. The architecture alone would be worth it. Maybe someday I will go. It really is a beautiful place! These pictures look like they're post cards. There's so many beautiful places in Italy. The river looks so clean and tranquil. I love the atmosphere here and wonder if people living nearby stay here to relieve stress all the time. Great photos! definitely more reasons to visit florence. I love traveling to places with great history and architecture. Aside from the Arno River, which we saw en route to the Leaning Tower, I have not yet visited the town proper of Pisa. 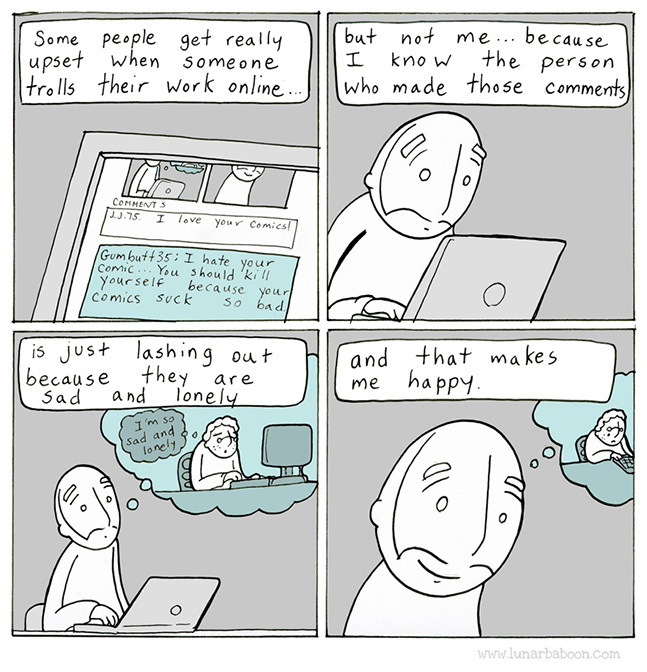 Thanks for bringing me there. The charm of Italian towns is clearly appreciated in these pics. Pisa is such a beautiful place. I haven't been since I was in high school, though. Maybe time to plan a repeat visit. All the buildings looks classic and historical especially the cathedral and the little church building. I am thinking how awesome they are to build and create such beautiful ornaments in the past. Again a masterpiece review on sculpture and history of Italy. I went to Pisa and just saw Leaning Tower but you are exploring many new locations in Pisa, which is great. The river with beautiful buildings on both sides is enchanting. 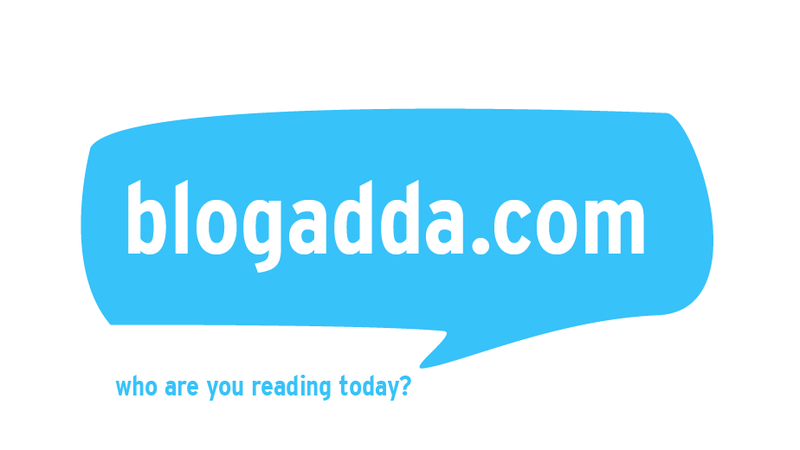 Congrats as your blog is within Top 100 India Blogs. Gr8 Achievement. Secretly trying to spot your baby bump! Envious of how you are still traveling despite being pregnant! Your baby will be a happy baby! Am I not misled by my vision that the place looks clean especially the river. It is free from any garbage or dispose from the home, school, or industrial wastes. 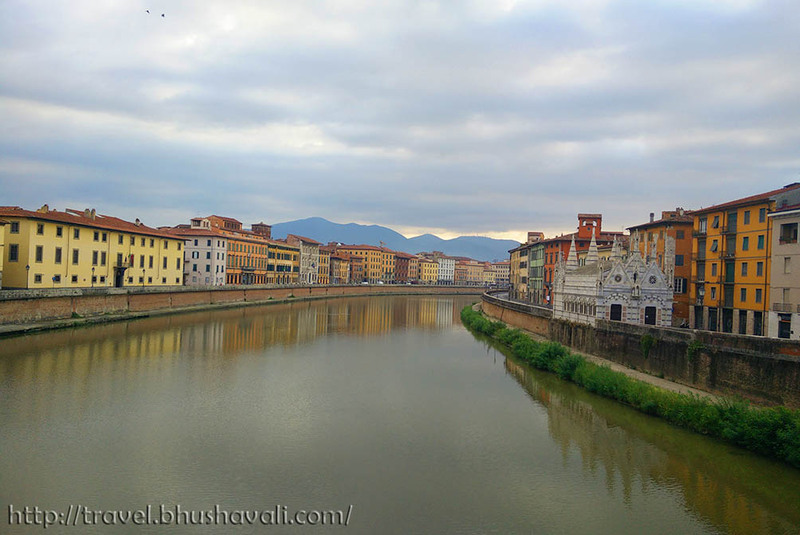 Are you alone roaming the beautiful, clean town of Pisa? I know you have a company, your official photographer, I think. Congratulations on your accomplishments! You deserve it! Pisa looks like a lovely place to explore. The streets are clean and it is not crowded with a lot of tourists. I like the small church and art sculptures. Italy is truly a place of history and beauty. It seems like a very great place to go to. Congratulations for the the nomination! I haven't been able to get here yet, but I really want to! This is a great little look at Pisa. It's more than just the towe, that's for sure! I love everything about Italy. Their lifestyle, countryside, architectures, people, and what not. I have been conspiring to be in Italy soon. Pisa Town looks great as like any other town in Italy. Would save it for my trip. Tuscany is my favourite part of Italy and I adored my day trip to Pisa (I wished I'd had more time though!). The Santa Maria della Spina was my favourite, because it was so unexpected! I've never seen any pictures of Pisa other than the famous tower. The town looks full of colorful and Instagrammable buildings. The Santa Maria della Spina really s a tiny church, your picture in front of it shows how tiny it is! So this article has been rightly timed for us as we are visiting Italy this August and thankfully have also included Pisa in the list. Santa Maria della Spina looks so pretty and we will make sure that we uncover everything that's on your list. Such beautiful streets. Most of the towns in Europe are worth exploring on foot. Love the artwork as well. I don't think this resembles so much with Edinburgh. I never thought there is anything more to Pisa other than the Leaning Tower. Love those cobbled streets. Great for an evening walk. Such a nice place! Wonderful architectures and streets. You had a really great accomplishment. Congratulations!